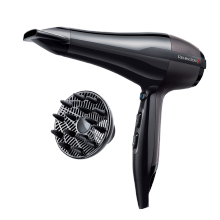 This time saving beauty boasts a powerful 800W motor that delivers fast, efficient drying and styling in no time at all. The heated flow is channelled straight to your locks, drying as you style for super speedy, gorgeous results every time. Designed to give you a multitude of stunning, head-turning looks, the Remington Dry & Style boasts three attachments that have been cleverly designed to ensure you can blow dry whilst creating your desired look, so you’ll have quick and easy styling at your fingertips. The 21mm bristle brush can be used to create smooth yet pretty curls and feminine flicks, whilst the 38mm thermal bristle brush will deliver a full, voluminous look and loose curls. 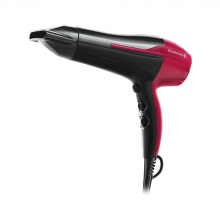 Use the fast dry concentrator for a silky-smooth and sleek salon standard blow dry finish.